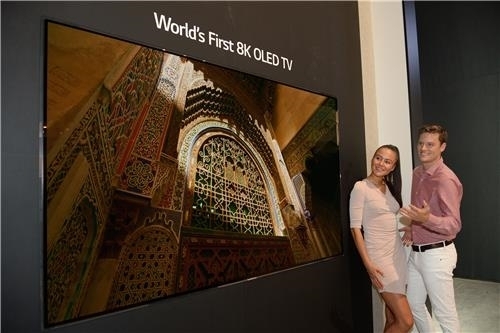 South Korean premium TV maker LG Electronics said Wednesday that it would introduce the world’s first 8K organic light-emitting diode TV in Berlin, containing 7,680x4,320 pixels. The 88-inch 8K LG OLED TV will be the biggest OLED screen to be unveiled at the IFA 2018, the biggest show for home appliances in Europe, running for six days from Friday in the German capital. The 8K OLED TV will feature over 33 million self-emitting pixels to produce an unmatched contrast ratio and true blacks that define the OLED TV’s iconic picture quality, the company said. LG was the first company in the world to provide OLED TVs in 2013, and is introducing the 8K OLED TVs for the first time in the world this year. “LG will continue to increase the OLED share of its premium TV portfolio, and drive large-scale consumer adoption of OLED TVs,” the company said. The premium TV market is largely divided into OLED and non-OLED TVs, which are mostly based on liquid-crystal displays and face the need to eliminate backlighting for better picture quality and TV design. According to market researchers, global OLED TV shipments are expected to be around 2.5 million units this year and to rise to 9.35 million units by 2022. Samsung is containing the expansion of the OLED TV share in the premium market with quantum dot light-emitting diode TVs that still use LCD panels. Samsung will also introduce its 8K QLED TV at the IFA 2018 on Thursday, which could spark competition for the highest resolution in the large-screen premium TV market down the road. “LG’s first 8K OLED TV is the pinnacle of technological achievement and the next evolutionary step in display technology” said Brian Kwon, president of LG’s home entertainment business. Displays of 4K OLED played a major role in reshaping the TV industry, and LG is confident that 8K OLED will do the same.